Simply put , the forces of demand and supply will always take preeminence when Vanilla Beans become scarce. What we're seeing on the global market, and in this particular case in Tampa Florida USA; the Vanilla Demand is on the rise and the consumers who are not ready to compromise quality are showing willingness to open their wallets more yet the supply for Vanilla Beans remains comparatively low. This means that the vanilla retailers are going to make bigger orders from the Bulk Sellers/Curers in Madagascar , Uganda, Mexico , and Papa New Guinea. These Vanilla orders will then result in stiff competition for the green Vanilla Beans on the Vanilla plantations; the farmer having no choice will sell his beans to the highest bidder , and increased prices of the green bean will thus cause further increase in the prices for the cured Vanilla beans. The only Caveat to this cascade of ever increasing vanilla prices would be an increase in vanilla productions from farmers who previously did not pollinate their plants due to poor prices. Now that last years prices were much better , many Vanilla farmers went back to their plantations to pollinate. The farmers who are just starting to plant vanilla today will only harvest Vanilla beans in about 3 years time. And this therefore will have no effect on the vanilla prices for this year 2017. 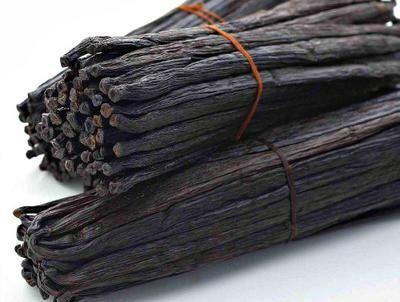 A pound of vanilla beans selling for nearly $500? Yeah, right. The shortage can't be that bad. Back in April, retailers like Bailey were paying about $61 per pound-- and upset it was double from the year before. His shop was selling fresh vanilla beans for about $1 each and an 8-ounce jar of pure vanilla extract for about $25. Those already robust vanilla prices have since doubled, and this past week, he's had to raise them yet again at his downtown St. Petersburg business, the Savory Spice Shop. The new price tag for his customers: $5.95 per bean, or $42.35 for 8 ounces of Mexican vanilla extract. Bailey said he was forced to hike prices again because he's paying $424 per pound. "I'm telling people to make (the extract) themselves," Bailey said, adding that most aren't even "blinking" at the price. Vanilla is the second-most-expensive spice on the market, behind saffron. In six years in the business of selling retail spices, Bailey has never seen the price skyrocket like this. Neither has chocolatier Bill Brown, owner of William Dean Chocolates in Belleair Bluffs. He has been sleuthing any source he can find to make sure he has enough vanilla beans to get him through Valentine's Day. "I put vanilla bean in everything because I love it," he said on the phone as he scoured the Internet for affordable prices. "My accountant's going to yell. I just spent $600 on 2.5 pounds of vanilla beans." Going through at least a couple of pounds a week, Brown already stocked up about 10 pounds of beans, fearful that he will have to start scaling back the golden ingredient in his recipes. He's unable to raise his prices, he said, and the extra cost is cutting into the company's profits. "I'm putting my head in the sand and hoping it goes away in a couple of months," he said. For now, he's buying vanilla whenever he finds a deal, like at Restaurant Depot in Largo last week. "I just bought all the ones on the shelf," he said. "They're like, 'Why are you using them?' because they're so expensive, and I wanted to say, 'I'm almost stealing them for you for this price.'?" The shortage is blamed on a poor crop in Madagascar that began in mid 2014. The country produces about 85 percent of the world's vanilla supply, which typically totals between 2,500 and 3,000 metric tons of beans annually. In 2015, the world's vanilla growers produced only about 1,000 metric tons. "It's amazing," said Brent Reame, chief operating officer of Beanilla, a Michigan-based vanilla supplier. In April, he predicted the shortage could send the price as high as $500 before the 2016 harvest hits the market this year. "I think it hit $550 back in 2005 and then it crashed quickly. We are not expecting that to happen this year … these prices are only going to continue to rise for the next six months or at least hold steady." "People who want that flavor or the appearance are still paying for it," Reame said, echoing Bailey's experience. "There's a lot of traditional recipes where they've always used a vanilla bean or they've always used pure vanilla, and the economy is good enough where there's enough disposable income to get the real thing." He said the prices have driven away many food manufacturing companies that have turned to artificial vanilla. Most vanilla ice cream flavoring, for example, is made from a compound called vanillin. Sean Greenwood, a spokesman for Ben & Jerry's, which lists vanilla extract and vanilla beans in the ingredient list in its vanilla ice cream, said he is "aware of no plans to alter our pricing due to vanilla." Chef Rosana Rivera, the owner of French bakery and restaurant Piquant in Tampa's Hyde Park Village, said that vanilla prices have remained steady at about $210 per pound for the past several months. In April, she was paying about $150 but noted that her supplier was able to stock up before the latest jump in prices. "As more and more manufacturers and companies in the food industry seek pure, natural ingredients and focus on having a clean label, I think there will always be demand for pure vanilla."